Pope Francis greets residents of Varginha slum inside the local church, in Rio de Janeiro, Brazil, July 25, 2013. RIO DE JANEIRO — Pope Francis on Thursday issued the first social manifesto of his young pontificate, telling slum dwellers in Brazil that the world's rich must do much more to wipe out vast inequalities between the haves and the have-nots. The pope also urged Brazil's youth, who have taken part in recent protests showing discontent with the status quo, to keep alive their “sensitivity towards injustice” and be a catalyst in the fight against corruption. The first Latin American pope, who has rallied the Church on behalf of the poor and who lives more austerely than his predecessors, called for a “culture of solidarity” to replace the “selfishness and individualism” prevailing in modern society. 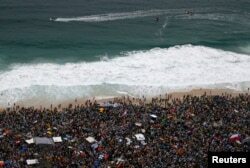 Lifeguards patrol offshore as Catholic pilgrims await the arrival of Pope Francis on Copacabana beach in Rio de Janeiro, Brazil, July 25, 2013. Reflecting his humble personal style, Francis said he would like to have been able to stop in every Brazilian home “to ask for a glass of cold water, to take a cafezinho, but not a shot of cachaEca,” a mention of Brazilian rum that drew laughter from the crowd. But he said more needed to be done to bridge the gap between rich and poor at the root of social injustice, in a reference to the police occupation of Rio's slums started last year to “pacify” drug-related violence. “No amount of 'pacification' will be able to last, nor will harmony and happiness be attained in a society that ignores, pushes to the margins or excludes a part of itself,” he said. Manguinhos, home to about 35,000 poor people, was known locally as “Gaza Strip” for its frequent shootings. It is one of the slums that have been part of a community policing operation that has reduced violence in the shantytowns of Rio de Janeiro. On Thursday evening he is to welcome participants in the World Youth Day from a stage on the crescent shaped Copacabana beach. More than one million people are expected for the event. On Sunday, he presides at the close of World Youth Day in a pasture outside Rio before leaving for Rome that evening.